They will dig deep holes throughout your lawn looking for grubs and earthworms. Armadillos are nocturnal. Adult armadillos usually weigh about 10-16 pounds and are about 26-32 inches long. An armadillo will eat many insects, or other invertebrates, but they seem to enjoy earthworms and grubs the most. 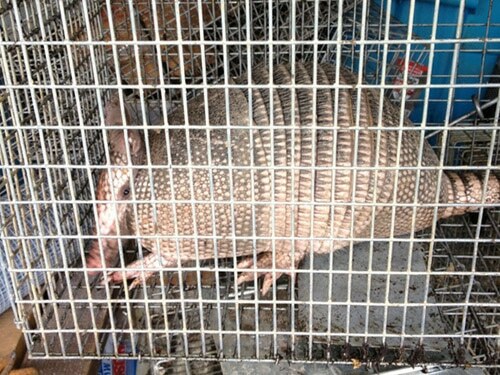 A-1 Wildlife Service can trap the armadillos for you. We offer a trapping program where we actually trap the animal and relocate it. There are many types of lawn treatments out there that claim to solve your problem. We have had customers who have tried all of them and the treatment is ineffective. The only for sure way to treat an armadillo problem is to trap and remove the armadillo.